The Boys & Girls Club of Ridgefield has announced that for the third year in a row our Club is the recipient of a National Program Award from Boys & Girls Clubs of America. The Boys & Girls Club explains, "At the 111th National Conference in Dallas, Texas, Mike, Kristin and Jess, pictured here with Dr. Damon Williams, Senior Vice President of BGCA, accepted the National Merit Award for Program Excellence in the core area of The Arts for our performing arts programs, particularly Jammin' with Jess and Coffeehouse! The Merit Awards for Program Excellence are sponsored by Metlife Foundation, and as an honoree we will also receive a $2,500 award." 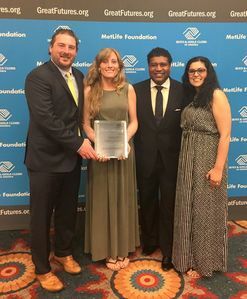 With over 4,200 Boys & Girls Club Nationwide and overseas The Boys & Girls Club of Ridgefield is proud to be recognized for their continued success. "We couldn't do it without all of our donors, supporters, amazing staff, and of course Club members - thank you!" The Boys & Girls Club of Ridgefield wrote on their Facebook Page.